The last leg higher has been directly responsive to the ramp up in the political “marketing surge” surrounding “tax cuts and tax reform.” With the House having already passed their respective budget resolutions, late Thursday, the Senate passed a budget blueprint for the next fiscal year. With both of the “budget resolutions” in place, it was seen as clearing a hurdle to the goal of overhauling the tax code. This is not new, of course, as the entire rally for the markets since the election has been driven by hopes of lower taxes, despite disaster, floods, fires and Central Bank threats of liquidity extraction. The bulls are clearly in charge which keeps us allocated to towards equity risk currently. Since 2014, the stock market has risen (capital appreciation only) by 35% while reported earnings growth has risen by a whopping 2%. A 2% growth in earnings over the last 3-years hardly justifies a 33% premium over earnings. Of course, even reported earnings is somewhat misleading due to the heavy use of share repurchases to artificially inflate reported earnings on a per share basis. However, corporate profits after tax give us a better idea of what profits actually were since that is the amount left over after those taxes were paid. Again we see the same picture of a 32% premium over a 3% cumulative growth in corporate profits after tax. There is little justification to be found to support the idea that earnings growth is the main driver behind asset prices currently. We can also use the data above to construct a valuation measure of price divided by corporate profits after tax. As with all valuation measures we have discussed as of late, and forward return expectations from such levels, the P/CPATAX ratio just hit the second highest level in history. 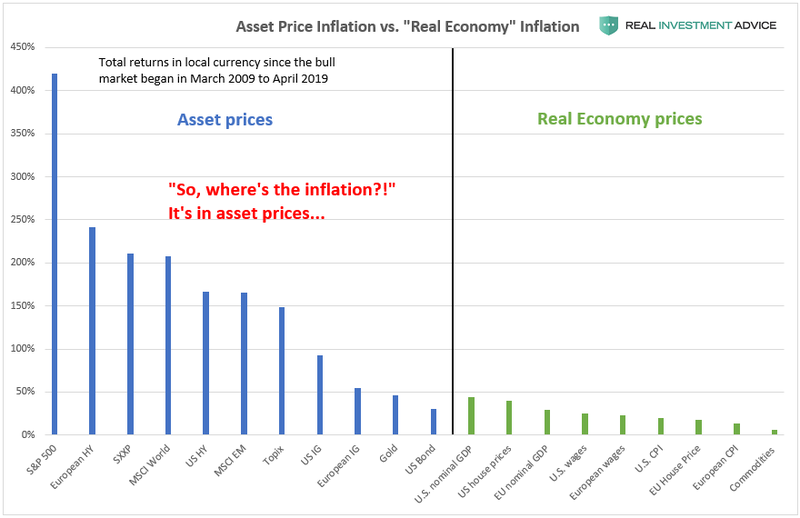 The reality, of course, is that investors are simply chasing asset prices higher as exuberance overtakes logic and their actions prove the case. According to data from FactSet, stock-based exchange-traded funds have seen nearly $16 billion in inflows over the past week, which represents an acceleration from recent positioning. Over the past month, about $31.3 billion has gone into stock-based ETFs. The chart below of data from ICI shows much of the same with monthly equity ETF inflows surging since the election. The same is seen when we also add in equity mutual funds for a look at total equity asset flows. Not surprisingly, those actions have been backed by their massive elevation in bullish sentiment. “Consumer sentiment surged in early October, reaching its highest level since the start of 2004. The October gain was broadly shared, occurring among all age and income subgroups and across all partisan viewpoints. Most hated bull market ever…hardly. Historically speaking, you only witness such exuberance in the latter stages of an expansion, not the beginnings of one. The latest survey indicates that consumers do not anticipate an economic downturn anytime in the foreseeable future, which from a contrarian perspective may be a clear warning sign. Clearly, the expected benefits of tax cuts and reforms is leading investors to overpay for something today they are hoping will become fairly valued tomorrow. In other words, instead of prices catching “down” to market fundamentals, investors are hoping fundamentals will “catch up” to prices. Unfortunately, there isn’t a previous case in history where this has been the case. Also, when we look at 20-year trailing returns, there is sufficient historical evidence to suggest total, real returns, will decline towards zero over the next 3-years from 7% annualized currently. Re-read that last sentence again and look closely at the chart above. From current valuation levels, the annualized return on stocks by the end of the current 20-year cycle will be close to 0%. A decline in the next 3-years of only 30%, the average drawdown during a recession, will achieve that goal. While investors may “get back to even,” eventually, following a crash, the shortfall from their actual financial goal continues to build. This is why using some method of risk management, such as a simple moving average crossover, can help alleviate some of the financial damage caused by drawdowns. YES! You will miss out on some gains in the market. YES! You will be much more successful in obtaining your financial goals long-term. After all, isn’t that why you invest in the first place? What I can assure you of is that you WILL be wrong from time to time and you WILL lose money. But that is the inherent nature of investing. It is a “RISK” based endeavor. However, I can absolutely guarantee that trying to “passively index” in the current market environment will absolutely wind up screwing up your long-term goals. 19.7% of retirees get 100% of their income from Social Security. A full third (33.4%) depend on it for 90% of their income. And 61.1% get at least half their income from Social Security. The federal government’s unfunded 75-year liability for Social Security and Medicare combined is $46.7 trillion. Are you absolutely sure you want to rely on the Government for your retirement? The bull market continues to be fueled by hopes that tax cuts and tax reform will lead to higher reported earnings for corporations. While it is true that tax cuts will improve earnings, whatever improvement is given is likely already priced into forward operating estimates over the next two years. With small caps and the Russell 2000 at the highest valuations since the “dot.com” crash, the risk of disappointment is elevated. Technology, Industrials, and Materials – continued their charge again this past week as movement toward tax cuts boosted these sectors higher. These sectors are EXTREMELY overbought short-term. Taking some gains in is likely a good idea at this juncture, but remain weighted in these sectors for now. Financials and Healthcare had stumbled a bit previously but regained their footing this past week as bank earnings came in and the Administration has agreed to bail out “ObamaCare” for at least 2-years (translated that means “forever” in Government speak). Trends remain bullish, but are overbought as is the market in general. While the underlying technicals are beginning to improve, the sector must stay above the 50-dma while working off the extremely overbought condition that currently exists. A violation will likely return the sector back to it previous downtrend. We continue to remain out of the sector entirely currently, but if the recent improvement can reverse the negative trends we will add weight to portfolios. Discretionary and Staples remain under pressure as the consumer weakness continues to spread through the underlying companies. That story is a macroeconomic story that is being ignored by the rest of the market currently, however, it will eventually be the “tail that wags to dog.” While Discretionary remains in a positive trend, Staples are showing significant weakness. Reduce exposure with the break of the 200-dma for now. Utilities, as noted last week, were VERY oversold and the pop in interest rates following the announcement of the Trump Tax Plan led to a violation of the 50-dma. However, as stated last week, Utilities have picked up performance lately and are testing previous highs. Remain long the sector and move stops up to recent lows. We previously took some gains out of these sectors but remain long for now. NOTE: Correlation between all markets is extremely high. What goes up together also comes down together. Gold – Last week, the precious metal failed to break back above the 50-dma. As money is chasing equities currently, and there is NO FEAR of a crash, gold has temporarily “lost its luster” as a safe haven. With the recent passage of budgets in both the House and Senate, the push to “tax reform” has gained a lot of steam over the last week. This makes gold a much less optimal investment at the moment. We continue to watch the commodity currently, but remain on the sidelines for now. S&P Dividend Stocks, after adding some additional exposure recently the index broke out to new highs and continues to climb. We are holding our positions for now with stops moved up to recent lows. Take some profits and rebalance accordingly. Dividend stocks have gotten WAY ahead of themselves currently as the yield chase continues. Bonds and REIT’s took a hit this week as “tax reform” moved forward and the expectations for higher inflation, wages, and economic growth pushed rates higher. While the economic benefit from tax reform is “WAY OVERSTATED,” we will continue to add more exposure if rates push towards 2.5-2.6% which is our target for this reversal. No changes this past week. We used the pop in interest rates to move cash management accounts, and larger cash holdings, into our cash allocation strategy providing for better yields. We also added some new bond exposure to accounts and are looking for additional opportunities if rates push higher over the next couple of weeks. Furthermore, the markets continue to push extremes on all fronts and, as noted in the chart above, it would require a near 13% decline just to intersect with the support and the long-term bullish trend. Extreme deviations from long-term trends don’t last forever, so caution is advised with overly aggressive exposure. I continue to suggest taking the recent advance as an opportunity to rebalance risk in portfolios by trimming overweight equity exposure and adding to fixed income exposure is a prudent goal this week.